Thailand's military-backed political party was last night heading for a surprise win over its populist rival that has led a "democratic front" in the first election since a 2014 coup. 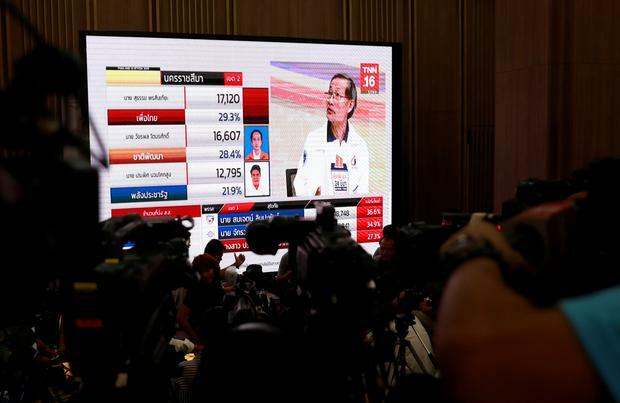 Early results, announced by the country's election commission after 89pc of votes had been counted, put Phalang Pracharat, led by military junta chief Prayuth Chan-o-cha, ahead with seven million votes. The opposition Pheu Thai party had 6.6 million. However, in a late twist, Ittiporn Boonprakong, the commission's chairman, said the full unofficial results would be declared only this morning, without giving any reason. Polling day saw a high turnout among Thailand's 51.2 million voters, many of whom were determined to cast their ballots after five years under military rule. Bharatha Mallawarachi, Krishan Francis, David Hughes and Alexander Britton Five Britons are among more than 200 people killed in a series of bombings which ripped through churches and luxury hotels in Sri Lanka.